Down the ages, rulers and conquerors have fused the imprint of their culture and civilization with local traditions in art and architecture. The heritage left to us is a mosaic of Indo-Saracenic, Chalukyan, Hoysala, Chola, Dravidian, Mughal, and Jain architecture. Arrive at Kundapur in the evening. Start from Kundapur and arrive at Dandeli wildlife sanctuary. Spend the day. OR Visit Banavasi, the second century Kadamba Temple and halt at Hubli. Leave Hubli at 6.30 a.m. Visit the temple in Banashankari. Go to Badami. Leave for Bijapur. Halt for the night. Visit Golgumbaz and other Historic monuments in Bijapur. Leave for Aihole, visit the old Ruins. Visit Pattadakal, the place known as the cradle of Indian Architecture. Proceed to Hampi. Visit the Glorious city of Vijayanagar at Hampi. Leave Hampi at 07.00 a.m. Stop for Lion Safari. Arrive at Kundapur in the evening. 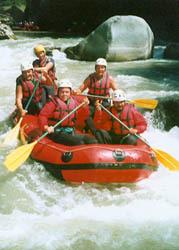 Dandeli is the gateway to the 834 sq. km. Dandeli Game Sanctuary. It is home to rare species of animals, like barking deer, sloth bear, civet cat, panther, Flying Squirrel and Malabar Squirrel. Woodpeckers and Hornbills are some of the birds sighted. Experience the thrills of jungle life by staying at the Kali Wilderness Camp, located on the edge of the Kali River or at the Bison River Resort. Ride down the Kali river in a coracle (round basket like boat), where you can watch crocodiles basking on the banks and water birds nesting. You can also take a jeep safari or walk along the nature trails in the forests. Banavasi was established as the capital city of the Kadamba kings who ruled the first Kannada Empire in c. 345AD. The Madhukeshwara Temple, is famed for its architecture, deriving its name from the honey coloured Linga. Of special interest is the intricately carved stone bed. The annual cultural festival "Kadambatsava" is held in the month of December. Nandi at Madhukeshwara Temple, Banavasi. 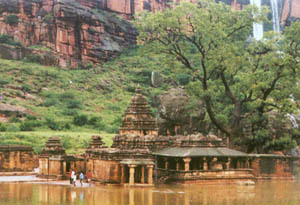 Five km from Badami, Banashankari is one of the most ancient shrines in Karnataka, dedicated to the goddess. 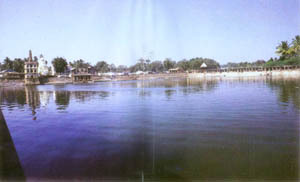 Harishchandra Theertha, a large sacred pool in front of the temple is a fine example of Chalukyan architecture. Situated 22 km. from Pattadakallu, a picturesque country side, at the foot of a sandstone ravine, Badami, a Taluk headquarters town, was once the capital of the Chalukyas. The area is a treasure house of architecture and sculpture, and marks some of the earliest and finest examples of rock cut caves and free standing temple architecture. They provided the blueprints for the temples that were built later all over South India. 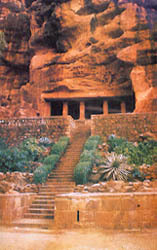 The four caves, can be reached by climbing the stone steps that are cut on the face of the sandstone cliffs. Whilst the first three caves are dedicated to the Gods of the Hindu pantheon, the last cave is a Jain Temple which has several Jain deities including a huge idol of Parshwanatha. The first cave is dedicated to Shiva and contains the beautiful image of Nataraja (Dancing Shiva) with eighteen arms. The other sculptures are those of Ardhanareeshwara (half man and half woman), Harihara and Parvati. 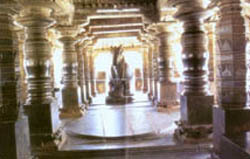 The third cave, dedicated to Vishnu, has a large image of Trivikrama and Vishnu sitting on the coiled serpent, Adisesha. 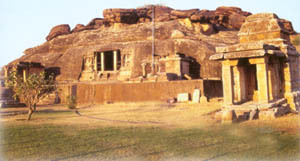 The caves overlooks a large lake, at the eastern edge of which, are the waterside Bhuthanatha temples. At the north west of the lake is the Archaecological Museum, which has superb examples of local sculpture. 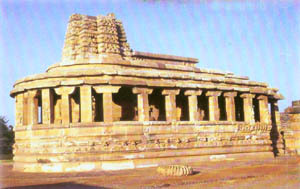 Twenty-two km from Aihole, on the left bank of the Malaprabha river lies Pattadakal. It is the second of two capitals of the Chalukyas, used mainly for the coronations of kings. 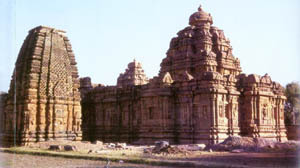 Pattadakal, declared by UNESCO as a World Heritage Site, was an experimentation ground for temple architecture. Two main types of temple architecture are laid out side by side. On the one side, stand the curvilinear shikaras (spires) of the Kasivishweshwara, Jambulinga, and the Galaganatha temples, and on the other the Mallikarjuna, Sangameshwara and the Virupaksha temples with their square roofs and receding tiers. The most important monuments here are the Virupaksha & Mallikarjund temples built between 740 to 745 A.D to commemorate the victory of Vikramaditya the 2nd, over the Pallavas of Kanchipuram. Aihole was the capital of the Chalukyan kings, between the 4th and 6th century A.D., when they began experimenting with the idea of constructing temples with blocks of stone. 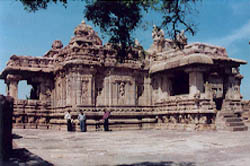 The evidence of Hindu temple architecture seen here indicates a growth from an early embryonic stage to more complex forms. 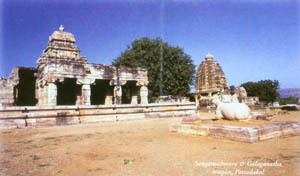 Simple shrines like those in the Konthigudi group and the Lad Khan temple, developed to the more complex edifices, such as the Meguthi temple. Aihole has over 125 temples all intricately carved and rich in details. The oldest temple here is the Lad Khan temple darting back to 5th Century A.D. The Durga temple has a semi circular apse and a sanctum, encircled by a richly carved colonnaded passageway. The Hutchamalli temple, the Ravalphadi Cave Temple, the Konthi temple complex, the Jain Meghuthi temple and the two storied Buddhist temple are the sites worth visiting. 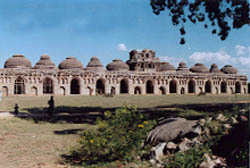 Bijapur was the capital city during the Adil Shahi dynasty. It has its share of historical, cultural and architectural interest. Gol Gumbaz, Jumma Masid and Malik – e – Maidan lie within its environs. 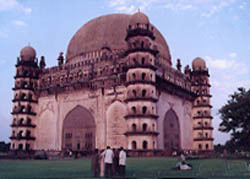 Gol Gumbaz, is believed to be the second largest tomb in the world. The circular dome has a diameter of 44 metres. There are no supports within its span, giving it the illusion of an unsupported structure. A mere murmur from its whispering gallery is echoed seven times over before it dies out. Jumma Masjid is still used for worship and has been called one of the finest mosques in India. It holds an exquisite copy of the Koran. The script is embossed in gold. Ibrahim Roza, the mausoleum of Adil Shahi II is said to have inspired the architects of the Taj Mahal. 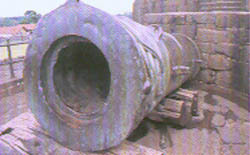 The Malik – e – Maidan is believed to be the largest medieval cannon in the world. It is 14 ft. long and is estimated to weigh 55 tons. Legend has it that, whoever touches the gun and makes a wish, will have that wish fulfilled. Another world heritage centre is located in Hampi, the erstwhile capital of the Vijayanagar kingdom. 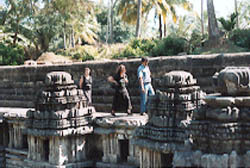 It is the most beautiful ruins in Karnataka, which above others evokes the spirit of an age long lost. It abounds with delightful surprises. Here you can see the scales on which kings weighed themselves against grain, gold or money, which they later distributed to the poor. The queens bath, with its arched corridors, projected balconies and lotus shaped fountains that once sprayed perfumed water is another wonder. The huge elephant stables, the two storied Lotus Mahal which is designed in such a way when the atmospheric temperature goes up the water in the tank starts circulating in the hollow place inside the wall keeping the room cool. The circulated water goes back to the overhead tank, gets cooled & again starts circulating. The magnificent Vithala Temple with its musical pillars and stone chariot and the Virupaksha Temple that is still used for worship will add to your astonishment. The 6.7m monolith Ugra Narasimha, the Pushkarini tank, the Mahanavani Dibba and so much more are there to be discovered. The Vijayanagar Festival is organised by the Government of Karnatka in December. Dance, drama, music, fireworks, puppet shows, spectacular processions... all combine to re-create the grandeur of the bygone era.